Technology / Solution　Stabilization of Solder Quantity,Stable Heat Supply Technology,Stable Soldering Tip Technology | Soldering robot - robot soldering - COSMIC CORP.
Heat stability and quick thermal recovery of the soldering tip are very important at soldering consecutively and for the parts which has big heat loss. An important reason for quantitative stabilization of the solder amount is that if the solder amount varies in particular when automating, the temperature that melts the solder changes and continuous stability is lost. In terms of quality, it also causes bridges, solder sags to the backside of PCB, and a lack of solderability. In the conventional soldering iron system, solder is mostly sent to the soldering iron tip from a place far away with guide tube. 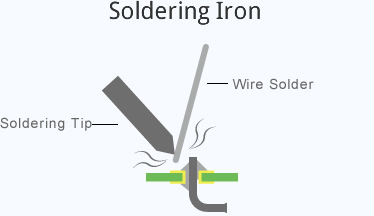 The solder amount (length) changes due to play within the guide tube and this causes uncertain solder amount for melting and difficult for stable solder supply to the work. The Cosmic's soldering robot system, “PSU500,” has only about 30 mm from the feed mechanism to the cutting unit. For this reason, solder wire is always fed straight. PSU500 can stabilize “absolute amount of solder wire” by pulling solder just before cutting unit, not from the place far away. Stabilized cut solder is all supplied to the place for soldering. Stabilized cut solder is all supplied to the work and properly soldered without remaining on soldering tip because ceramic soldering tips does not get wet. The PSU500 enables soldering without bridging even with fine pitch soldering. It makes visual inspection easier. By stable and uniform solder amount, the shape of the solder surface becomes same, thus the through-hole can be checked easily as well. It is also very advantageous for visual inspections (image processing) such as with a camera. It keeps material costs down. Because the PSU500 uses wire solder, it is cheaper than using solder paste. The PSU500 produces almost no solder waste and it's good for the environment. There is very little flux explosion and it results in little solder balls as well because heat expansion pressure of flux can escape from the solder cutting surface when the solder is melted. Solder and flux explosions that took place because they had been wrapped up in the soldering tip. And they are blocked by the walls of the soldering tips, resulting in even less spattering outside. Temperature of soldering tip is quickly recovered at next soldering point even if it goes down during soldering. 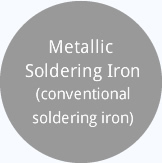 This contributes always possible to solder with the same condition. In general, metal soldering iron tips are used for soldering and temperature is approximately 230°C to 400°C. This temperature setting assumes that there are no thermal damages to parts and the work after considering the wettability of the solder. 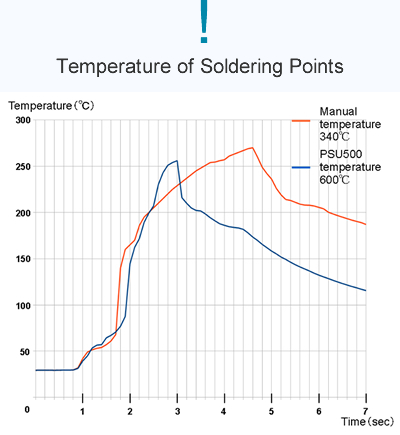 Considering the above, when we made soldering with a high-temperature (ceramic heater temperature at 600°C) , of course no damage to the work, it was confirmed that temperature of soldering points became as per the profile given below. 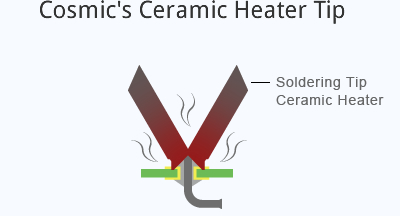 The temperature of the ceramic soldering tip is set at a high temperature of approximately 500°C to 600°C. Even though there is a rapid rise in temperature, the solder will not get so hot. This is because the temperature becomes a “Contact Temperature”. It can retain heat but the solder does not wet on the heaters. If the soldering tip is “metallic”, solder is merged by the solder melting (wetting) with the soldering tip and the temperature of the solder reaches almost same temperature with the soldering tip. The soldering tip is never getting wet because it is made by ceramic and the heat is transferred by contact thermal. This is different than metal soldering iron tip. (Heat does not transfer a lot in case of contact thermal by ceramic use.) This means the solder will never reach the temperature of soldering tip at soldering even if the soldering tip is at a high temperature. There is sufficient thermal effect and it enables soldering while preventing the oxidization of the solder by isolating the temperature from the external atmosphere. Only the temperature will gradually rise by the heat-retaining effect after a long period of time (several tens of minutes). We believe soldering hinges on “the time” from the start of soldering to the end of soldering and “the total heat amount” transferred to the solder and parts. 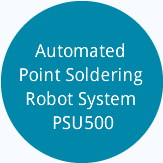 This means Cosmic's automated point soldering robot system PSU500 enables soldering by keeping the impact of heat on the work to be minimum by quick soldering, even if the soldering tip is high temperature. Also it enables high-speed and highly accurate soldering comparing to metal soldering iron. Conventional metal soldering iron tip may leave residues on PCB that could cause various problems unless conductive materials such as solder and flux (carbon) are removed from the soldering tip after soldering.By taking advantage of ceramic soldering tip, we can reduce problems mentioned above. Raising ceramic soldering tip to be high temperature, it makes solder & flux residues difficult to stay on the soldering tip. PSU500 can make soldering the component which has big heat loss such as grand pattern and shield case in a relatively short time. Comparing to conventional metal type soldering iron tips, the PSU500 conducts the heat to the tip well because it uses ceramic heaters that raise temperatures rapidly. 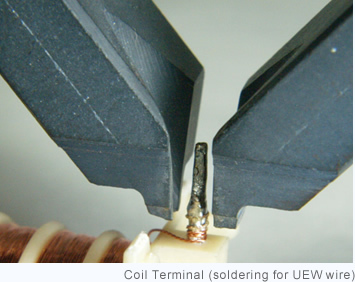 And also heat lost during soldering is recovered quickly because the soldering tip is combined with heaters. Controlling heat in short time is possible by heaters with a quick tip temperature recovery. The impact of heat can be minimized by controlling the heat conduction time even for heat-sensitive parts such as LED and FPC. 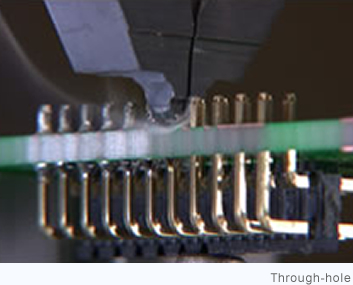 Cosmic's automated point soldering robot system, PSU500, uses ceramic heaters directly for its soldering tip. PSU500 can always supply stable heat to the work and solder because no solder "leaching" by the formation of an alloy with the solder. And also the shape of the soldering tip will be not changed because wearing caused by oxidization is not happened, our system is not like a metal type soldering iron tips.Each soldering condition does not change because our ceramic soldering tip can hardly get dirty and free from wetting by solder. No solder projections (peaks) and no bridges since the soldering tip does not drag the solder. The life-span of the ceramic heater soldering tip is long, allowing over 2,000 hours of usage with the standard shaped one. Cosmic's "Cutting and Soldering System” uses two soldering tips for soldering. PSU500 has superior heat retention through heat shield because it encloses the solder and soldering point by two soldering tips to prevent the heat to escape to the outside. For this reason, PSU500 enables securely wetting the solder to the inside of through-holes. The shape of the ceramic heater is maintained for a long time because it produces no metal "leaching. "When the heater positioning jig is used, it makes re-teaching unnecessary for a long time. It takes time for the solder to flow through the through-hole and go around to the back since the solder is heated from one side. Compared to soldering irons, in our PSU500, the solder flows through through-holes quicker and more securely because PSU500 supplies the heat from all directions so that it prevents heat releases to the outside.